A mainland Japan dance troupe is making a return engagement to Koza Music Town next weekend, ready to promote Japanese dance. A free show takes place June 20th at Music Town, with Morikuni Ota, an Okinawa dancer, teaming to demonstrate Tamagusuku style Gyokusen kai. 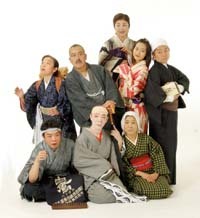 Ota’s joined by another Okinanwan dancer, Kaname Goya, and stage director for the mainland group, Nanahiko Asahi. Asahi will demonstrate Asahi style dance, demonstrating skills performed at the NHK culture center. Also performing at the 3 p.m. show will be Hikotari Asahi, the assistant director of the Asahi Style dance group. The big show, Ninjou Odori za, takes place the evening of June 21st. Tickets for the event are ¥2,500, and are now on sale at Koza Music Town. Saturday’s pre-performance event, billed as “Stage Tour: Let’s dance with hearty dance songs’, provides explanations of the Japanese dance that will, organizers say, make Sunday’s show more memorable. The mainland dance group appeared in Okinawa last year, but has integrated Okinawan dance into its repertoire for this year’s show.